The lava ooze is generally to be found deep in areas with plentiful volcanic ability, as well as any of the warmer outer dimensions. 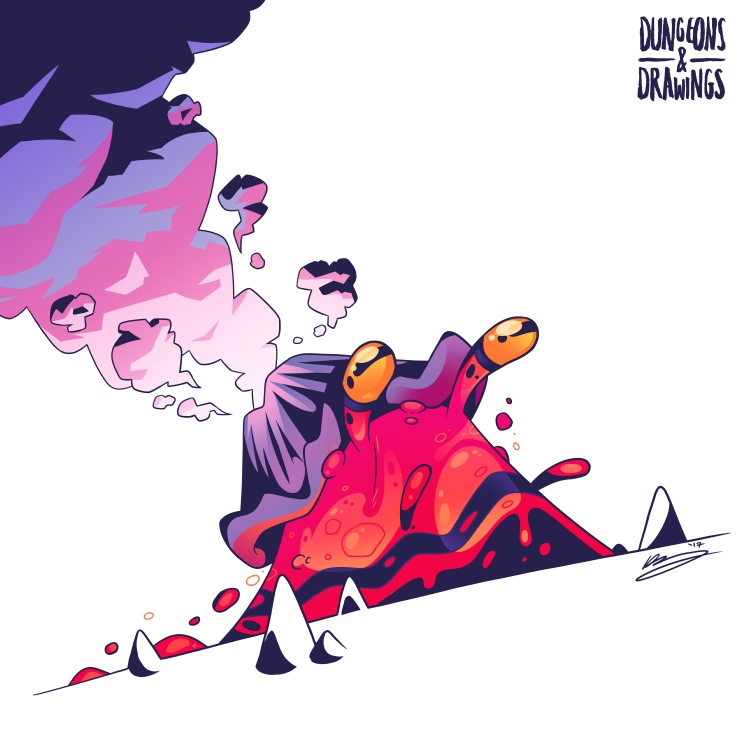 While oozes generally feed on flesh, the lava ooze subsists on minerals, with any minerals with a melting point higher than its body being excreted. Because of this, the lava ooze is relatively non-aggressive. However, they are able to sense especially rich minerals, meaning that those wearing armour or precious stones may find themselves targets. But it's not that big a threat, since you can just amble away from the ooze. They are slow. Me and Joe went to NYC recently and during our stay there I started doodling some oozes in my sketchbook. I've always found the ooze monster type really difficult to draw. Well, difficult to draw in an interesting way. There's only so many ways you can draw a blob. But I've recently been seeing a lot of really interesting sea slugs and I started using them as inspiration. I know most oozes are supposed to be kinda amorphous, blind, blobbity blobby blobs, but I kinda went for a half barnacle half snail thing here. We fought a little pack of these guys in our current campaign. We mostly ran away from them. We've been running away from a lot of creatures. It's honestly kinda fun to flee. Am I the only one to notice parallels between this monster (or rather, your interpretation therein) and the Pokemon Magcargo?